The production of moulded chocolate involves depositing liquid chocolate into suitable polycarbonate moulds. However, it is important that the moulds are pre-heated to a specific temperature before the chocolate is deposited. If the moulds are too warm, the chocolate can change its characteristics and de-temper, as it is deposited, and if they are too cold, they will set to quickly, loose shape and possibly crack. Previously, mould heating on the three moulding plants had been carried out by long wave, infra-red ceramic and metal element heaters. However, these were proving increasingly energy-inefficient, difficult to control and the growing brittleness of the ceramics was starting cause safety issues. 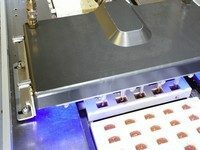 In an effort to solve these problems, the company contacted Heraeus because of the Neston company’s acknowledged expertise in infra-red in general and chocolate mould heating in particular. As a result, PID-controlled carbon infra-red heating systems have been installed on all three moulding machines. Two of these machines run at around 2.5 m/min (12 moulds/minute) while the third runs at 3.5 m/min (also 12 moulds/min.). All three machines feature a pyrometer which regulates the energy of the infra-red emitters to ensure that all mould temperatures are around 30ºC when filling takes place. The installation has proved particularly successful, providing better temperature control of the process and achieving energy savings of around 60%.